Sir Edward Mutesa II, KBE (November 19, 1924 - November 21, 1969), was the thirty-sixth kabaka (king) of Buganda from 1939 until his death, and the first President of Uganda from 1963 to 1966, when he was deposed and forced into exile by the Prime Minister, Milton Obote. Earlier, the two men had formed an alliance that swept them into power in the 1962 election. A year later, when Uganda became a republic, Mutesa was appointed non-executive President. After 1966, Obote, who appointed himself President, assumed more or less absolute power. Earlier, from 1953 until 1955, Mutesa had been exiled when the British tried to place his older half-brother on the throne. Mutesa was demanding an independent Buganda, which endangered British plans to grant Uganda's independence as a unitary state including Buganda. Now immensely popular, more than he had been before the exile, the British had no choice but to negotiate terms for his return. His full name was Sir Edward Frederick William David Walugembe Mutebi Luwangula Mutesa. He was often referred to as King Freddie in the foreign press, a nickname that was never widely used in Uganda. As king he was also leader of the Baganda people, the largest of the many ethnic groups in Uganda. Obote, who was the acknowledged leader of the independence movement, had needed Mutesa's support at the time but once in power set out to dismantle both the traditional kingships and the autonomy of provincial governments. Buganda had only joined the state on condition that it enjoyed a large degree of autonomy. In 1993, under a new constitution, Mutesa's son became the thirty-seventh kabaka. Buganda is a now a constitutional monarchy within Uganda. Mutesa had to walk a tightrope between the expectations of his people, the plans of the departing colonial power and the new politics of an infant state. In the end, he was a victim of Obote's ambitions. Arguably, although it was Mutesa and not the dictatorial Obote who bore the title king, he may have honored the constitution and shared power with others if he, not Obote, had won their feud. Buganda's Lukiko (Parliament) had already developed into a democratic chamber and had played a vital role since the 1900 agreement between the kingdom and Britain, although members were not elected until 1958. Mutesa was educated at King's College, Budo, a prestigious school in Uganda. He became the King of Buganda in 1939 following the death of his father, King Daudi Cwa II. He attended Magdalene College, Cambridge in England where he joined an officer training corps and was commissioned as a captain in the Grenadier Guards. At that time, Buganda was part of the British protectorate of Uganda. The British in Uganda ruled through many of the traditional chiefs or kings. The line of kings of Buganda can be traced back to the late fourteenth century. The years between 1945 and 1950 saw widespread protests against both the British Governor's government. In the early 1950s, the British Government floated the idea of uniting British East Africa (Uganda, Kenya and Tanganyika) into a federation. Africans feared that this would lead to their coming under the control of Kenya's white settler community, as had happened in Rhodesia. 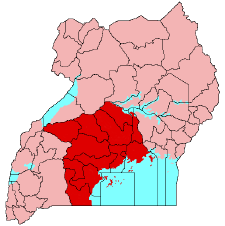 The Baganda, fearing they would lose the limited autonomy they had under British rule, were particularly opposed. Mutesa also opposed the proposal, and came into conflict with the British Governor, Sir Andrew Cohen. Cohen deposed and exiled the Kabaka in 1953, creating massive protest among the Baganda. Mutesa later said that he was offered a substantial private income if he abdicated. Cohen thought that Mutesa's older half brother would be easier to manipulate. He had not calculated on Mutesa's popularity, evidenced by a poem published in a local newspaper called the "Mutesa Psalm:" "We thank you, O Mutesa, everyone utters your name for your wonderful acts … the country praises the honor of Mutesa… May glory everlasting be to Mutesa." The whole of Buganda "solidified behind the throne" which symbolized their identity, which they thought was under attack. After two years in exile Mutesa was allowed to return to the throne under a negotiated settlement which made him a constitutional monarch and gave the Baganda the right to elect representatives to the kingdom's parliament, the Lukiiko. Mutesa's standing up to the Governor greatly boosted his popularity in the kingdom. Mutesa returned to Uganda and his throne in 1955 in what Lemarchand describes as "triumph." The Governor-General dropped the idea of an East African Federation in favor of an independent Uganda. However, his preference was for a unitary state. Mutesa rejected this. Both he and his people were against Bugandan membership of a "multi-racial state" and found support in the traditional kingdoms of Bunyoro, Toru, and Ankule. Joining a unitary state would forfeit their autonomy and de facto end their monarchies. Mutesa demanded that Buganda be transferred from the Colonial Office to the Foreign Office and be placed on a track to achieve independence as a secular state. This placed the Governor-General in a dilemma; an independent Uganda would need the wealthy, well educated and politicized Baganda (the people of Buganda) but unless they were guaranteed a large degree of autonomy, they would not join a free Uganda. The only option was to adopt a federal system. Within a unitary state, other groups were insufficiently politicized to "serve as a counterweight to Buganda" since, at this time, politics in Uganda "was essentially a Bugandan phenomenon." About this time, Milton Obote returned to Uganda from self-imposed exile in Kenya where he had taken part in the independence struggle. A chief's son from the largely non-politicized North, Obete had ambitions of his own. He became a member of the legislative Council in 1957. Realizing that Uganda needed the Bagandans if it was to be viable as a state, he entered a strategic alliance with Mutesa's royalist party, the Kabaka Yekka (king only). In 1962, Uganda, when Uganda became independent from Britain, the Buganda Kingdom was a semi-autonomous part of a federation. In the election, Mutesa's party won 21 seats while Obote Peoples Congress won 37. Other parties won 33, which gave the alliance a majority. Obote became executive Prime Minister. When the post of Governor General was abolished in 1963, this was replaced by a non-executive president and Mutesa was appointed. Although the Prime Minister exercised more power, it was hoped that the prestige of their king being President would satisfy the Baganda. Both Mutesa and Obote realized that Bugandan membership of the Ugandan state could only be achieved if the monarchy occupied a significant position. On the other hand, the Presidency was a compromise. Mutesa enjoyed "the shadow not the substance of power" and it remained an open question whether this would be sufficient to "protect the monarchy." A rift began to develop between the two men and both turned to army officers to pursue their ambitions. Obote began to favor the deputy army chief, Idi Amin while Mutesa recruited the support of Amin's superior, Brigadier Shaban Opolot, whose wife was the daughter of a prominent Bugandan minister. He was unlikely to support Obote. The coalition between Mutesa and Obote's parties finally collapsed in 1964 over the matter of a referendum which transferred two counties from Buganda to Bunyoro. On February 4, 1966, Obote lost a vote of no confidence in the Assembly following his alleged involvement in gold smuggling. Obote's response was to place five of his leading critics under arrest and promoted Amin as army chief, dismissing Opolot. Declaring himself President, Obote dissolved Parliament. In May, the Buganda declared independence from Uganda. The demanded that the federal government vacate the capital, which was in Buganda. Calling this treason, Obote sent his Amin besiege Museta in his palace. On May 23, Obote's soldiers destroyed the "royal drums" and Mutesa's second and final exile began. Mutesa may well have been planning a rebellion. The kingdom was sub-divided into four districts and the parliament turned into the Ministry of Defense. Obote's new constitution then abolished all of Uganda's kingdoms, including Buganda and the federal system. Obote, who ruled as an autocrat, was overthrown in a coup by his own army chief and trusted ally, Amin in 1971 although won election for a second Presidential term after Amin's overthrow in 1979. While in exile Mutesa wrote a published autobiography, "The Desecration of My Kingdom." Mutesa married several times. On November 9 1948, he married Abakyala Damali Catherine Nnakawombe. In 1950 he married Omubitokati Beatrice Kabasweka, of Toro and Kate Ndagire. In 1954, he married Abakyala Sarah Nalule. His fifth marriage was to Nesta M. Rugumayo, his sixth to Kaakako Rwanchwende, a princess of Ankole followed by Winifred Keihangwe, also a princess of Ankole. He had eleven sons and six daughters by various wives. He appointed Prince Ronald Mutebi as his successor, whose mother was Sarah Nalule. Mutesa died of alcohol poisoning in his London flat in 1969. Identified by the British police as suicide, the death has been viewed as assassination by those who claim Mutesa may have been force-fed vodka by agents of the Obote regime. Mutesa was interviewed in his flat only a few hours before his death by the British journalist John Simpson, who found that he was sober and in good spirits. Simpson reported this to the police the following day on hearing of Mutesa's death, although this line of inquiry was not pursued. Mutesa's body was returned to Uganda in 1971 after the overthrow of Obote and given a state funeral. Ironically, the new President who ordered the state funeral was Idi Amin, who as Army Commander had led the assault on Mutesa's palace in 1966. 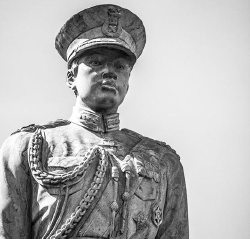 Mutesa II had the honor of serving as his nation's first President, and as such earned his place in history. His Presidency, which was short-lived, was followed by long periods of absolute rule by unscrupulous, ambition men. Mutesa was popular among his people, a symbol of a culture and head of a well established polity. Oddly, Obote may have modeled himself on the idea of the leader as a symbol of national unity. Obote preferred the unitary model, so ended the traditional monarchies. On the one hand, they could rival his central authority; on the other hand, he thought the kings represented an archaic from of leadership. Unfortunately, Obote was no democrat and his style of governance, which relied on the army to suppress opposition, did not nurture or equip leaders to replace the traditional elites. For his part, Mutesa II had adjusted to a constitutional monarchy following his 1955 return from exile and there is nothing to indicate that he wanted to rule Uganda as anything other than an elected President answerable to parliament and the people. In Buganda, the parliament or Lukiko had evolved from the ancient tribal council, and had played a role in the kingdom since the Agreement with the British of 1900. The monarchy was restored in 1993, together with the other three traditional kingdoms. Mutesa's, son Ronald Mutebi became king. He had been appointed heir by Mutesa in 1969. Mutesa II was created a Knight Commander of the British Empire on the New Year's honors list 1962. In 1953, he attended the coronation of Queen Elizabeth II of the United Kingdom. He held rank as Captain in the Grenadier Guards from 1947 until 1963, when he was promoted to Honorary Lieut-Col. From 1963 he was also a Major-General in the Ugandan Army. Other honors include Grand Commander of the Orders of the Phoenix of Greece, the Queen of Sheba of Ethiopia and the Order of the Brilliant Star of Zanzibar 1st class. ↑ René Lemarchand, African Kingships in Perspective: Political Change and Modernization in Monarchical Settings (Cass library of African studies : General studies no. 155. London, UK: Cass, 1977, ISBN 978-0714630274), 215. ↑ African Elections, Elections in Uganda, African Elections Database. Retrieved November 19, 2018. ↑ Phares Mukasa Mutibwa, Uganda Since Independence: A Story of Unfulfilled Hopes (Trenton, NJ: Africa World Press, 1992, ISBN 978-0865433564), 36. ↑ Royal Ark, The Abalasangeye Dynasty: Genealogy. Retrieved November 19, 2018. ↑ Hansard, Lukiko (Representation). Retrieved November 19, 2018. Kavuma, Paulo. Crisis in Buganda, 1953-1955: The Story of the Exile and Return of the Kabaka, Mutesa II. London, UK: Rex Collings, 1979. ISBN 9780860360988. Lemarchand, René. African Kingships in Perspective: Political Change and Modernization in Monarchical Settings. Cass library of African studies : General studies, no. 155. London, UK: Cass, 1977. ISBN 978-0714630274. Mulira, E.M.K. Sir Edward Mutesa, First President of Uganda and Former Kabaka of Buganda: His Life in Pictures. Kampala, UG, 1971. Mutesa. Desecration of my Kingdom. London, UK: Constable, 1984. Mutibwa, Phares Mukasa. Uganda Since Independence: A Story of Unfulfilled Hopes. Trenton, NJ: Africa World Press, 1992. ISBN 978-0865433564. The Untold Story of the Buganda Kingdom PBS program. History of "Mutesa II of Buganda"
This page was last modified on 20 November 2018, at 00:38.